^ 1.0 1.1 1.2 Fredheim, OM; Moksnes, K; Borchgrevink, PC; Kaasa, S; Dale, O. Clinical pharmacology of methadone for pain.. Acta Anaesthesiologica Scandinavica. August 2008, 52 (7): 879–89. PMID 18331375. doi:10.1111/j.1399-6576.2008.01597.x. ^ 2.0 2.1 2.2 Brown, R; Kraus, C; Fleming, M; Reddy, S. Methadone: applied pharmacology and use as adjunctive treatment in chronic pain. (PDF). Postgraduate Medical Journal. November 2004, 80 (949): 654–9. PMC 1743125. PMID 15537850. doi:10.1136/pgmj.2004.022988. ^ 3.0 3.1 3.2 3.3 3.4 3.5 3.6 Methadone Hydrochloride. The American Society of Health-System Pharmacists. [Dec 2015]. ^ Data table for Figure 1. Age-adjusted drug-poisoning and opioid-analgesic poisoning death rates: United States, 1999–2011 (PDF). CDC. [22 December 2015]. ^ Chou, R; Turner, JA; Devine, EB; Hansen, RN; Sullivan, SD; Blazina, I; Dana, T; Bougatsos, C; Deyo, RA. The effectiveness and risks of long-term opioid therapy for chronic pain: a systematic review for a National Institutes of Health Pathways to Prevention Workshop.. Annals of Internal Medicine. 17 February 2015, 162 (4): 276–86. PMID 25581257. doi:10.7326/M14-2559. ^ Methadone Matters: Evolving Community Methadone Treatment of Opiate Addiction. CRC Press. 2003: 13. ISBN 9780203633090. ^ Diphenypropylamine Derivatives. Encyclopedia of Drug Policy. 2011. ISBN 9781506338248. ^ WHO Model List of EssentialMedicines (PDF). World Health Organization. October 2013 [22 April 2014]. ^ Organization, World Health. Guidelines for the psychosocially assisted pharmacological treatment of opioid dependence.. Geneva: World Health Organization. 2009: 78. ISBN 9789241547543. ^ Hamilton, Richart. Tarascon Pocket Pharmacopoeia 2015 Deluxe Lab-Coat Edition. Jones & Bartlett Learning. 2015: 13. ISBN 9781284057560. ^ 嘉南療養院鼓勵戒毒. 民眾日報. 2009-07-07 [2009-07-12]. ^ 美沙冬替代療法　快斷炊了. 民眾日報. 2009-04-22 [2009-05-20]. ^ 美沙酮治療計劃. 香港特别行政区政府卫生署. 2013-03-26 [2016年8月9日] （中文（繁體）‎）. ^ Claudia Friesen, Mareike Roscher, Andreas Alt and Erich Miltner. 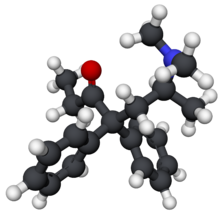 Methadone, Commonly Used as Maintenance Medication for Outpatient Treatment of Opioid Dependence, Kills Leukemia Cells and Overcomes Chemoresistance. Cancer Research. 2008, 68 (15): 6059–64. PMID 18676827. doi:10.1158/0008-5472.CAN-08-1227.